In a food processor, place first six ingredients; pulse until cranberries are finely chopped. Transfer to a small bowl; stir in thyme. In a large bowl, combine the beef, salt and pepper. Shape into 16 patties, about 1/2-inch thick. In a large nonstick skillet, cook patties in batches over medium heat for 3-4 minutes on each side or until a thermometer reads 160 degrees and juices run clear, topping with cheese during last minute of cooking. Spread mayonnaise over cut sides of rolls. 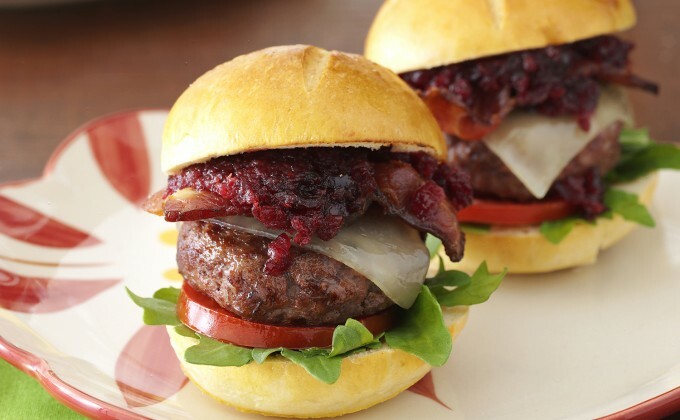 Layer bottoms with arugula, tomatoes, burgers, bacon and cranberry tapenade; replace tops. Arrange 1 or 2 burgers on temp-tations® small plates.